With the bidding process started on the southern United States border wall, Applied Research Associates' Pathfinder System is offering a unique alternative to physical construction. This next generation route detection system extends the capabilities of limited border resources. With only so many boots on the ground, Pathfinder can help direct support to the the right space, not the whole space. One of the first items on President Trump's list of things to do is build a wall along the US & Mexican border. Rob Jones is with us now, he's from Randolph VT, and he's the Chief of Counter Threat Technology Operations at Applied Research Associates. Now, Rob, you told me earlier that your system can track human activity long before they get to the wall with your new ground sensor, Pathfinder. Yes, we can. So essentially what you have is two type of sensors, but these are sensors that are designed specifically to detect human footsteps. So, in particular, border-related areas, we understand where those trafficking patterns occur. It's a function of having enough agents to cover down on all those movement corridors number one, and then number two, being able to match those agents effectively against the right amount of threats at any given time. What Pathfinder allows you to do is give enough standoff capability to understand I have human footstep trafficking behavior moving or approaching the US border and it gives an extended amount of time to react or increase your response based on what that treat does. Now, this isn't the first prototype of Pathfinder; this is an evolved prototype. Tell us about the first ground sensor and how you got to this point. That is correct. Now the first one was called E-UGS, that was fielded to the US Military. It is currently still deployed in a number of different regions around the world. So based on the success of that, it was also considered a footstep detection tool. We've taken the lessons learned and the soldier feedback that was provided based on the last seven years of operational activity throughout the middle east and we've input that into this particular sensor to give it better machine learning algorithms, better detection rates, higher probability of detection, and lower false alarm rates. So, we have a much better sensor today than what was currently fielded to the US Army and what is currently employed by US Forces. Is this system designed for both commercial and military uses? Absolutely, in addition to a number of different border applications, we are finding a lot of interest, both domestically and internationally, in the protection of critical infrastructure assets. In particular oil and gas pipelines, and the power grid. We are looking and talking with a number of companies about supplying them this capability. To again, give them standoff and an understanding of what are the trafficking patterns that are occurring in remote locations where they don't normally have personal to identify what's going on. And you told me this actually works like a doorbell? It does, so it's like an extended range doorbell. It's like your doorbell, but it can ring in excess of 25KM. When this goes off you know with full certainty there is a human walking in that particular location. You can decide what to do with that information. It also has the ability to tie into existing assets like cameras, and queue drones. We can send a detection message to a drone and automatically fly that drone to the location to see what's happening. Get full motion video and feedback so that we can identify if we need to spin up a particular counter threat response or can we just let this one go? So, how does it work? You said they are buried in the ground. They are. Pathfinder seismic sensors are buried just below the surface of the ground, as such. The only thing you see is the antenna; they are very difficult to find. That is why we've had such success with them throughout the Middle East. They are just so covert in nature they are hard to find physically because of their form, fit, and function. But, even electronically there's not an ability to use an electrical apparatus to detect and find this when it sends detection transmissions. It is literally off the grid for someone trying to counter that capability. How far away could someone be to be picked up by Pathfinder? With this particular sensor, we have deliberately limited the detection radii. With our employment methodology, we say it's about the right space, not the whole space. Instead of layering these like a lot of former Unattended Ground Sensors (UGS), like a mind field, or daisy patch approach, we take these and specifically apply them to routes, key locations, and areas where we suspect weapon caches. Over time we map the land and try to understand what those movement patterns are. Once we know where those threats are moving, we can choose when and where we interact that threat. It makes it look like a chance contact, so the threat doesn't have any reason to change their behavior. How expensive are these sensor systems to install? Pathfinder is actually very inexpensive. 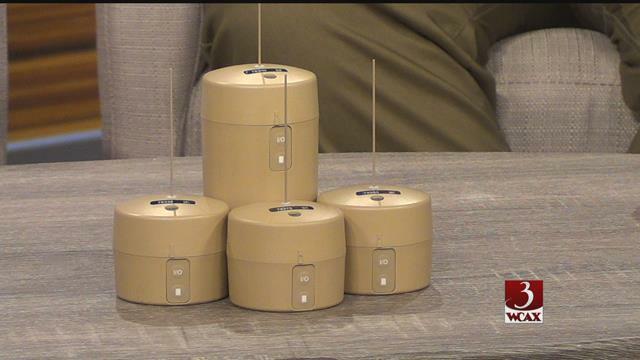 These seismic sensors run for a few hundred dollars; between $400 - 600 depending upon the application. It is a very low-cost system when compared to other ground sensors on the market. Has your company been contacted by the White House about the Southern Border? No, unfortunately, we have not had a call from the White House. We are waiting for the call any day now. Realistically, whatever our country needs us to do when the wall goes up, we have the capability, with or without the physical wall, that we can provide a lot of benefit along the border and provide a lot of protection for US assets both in the South and the North. Rob Jones, thank you very much for joining us today.